Astrid Llewelyn is now a fully trained unicorn hunter, but she can't solve all her problems with just a bow and arrow. Her boyfriend, Giovanni, has decided to leave Rome, the Cloisters is in dire financial straits, her best friend's powers seem to be mysteriously disintegrating, and Astrid can't help but feel that school, home, and her hopes of becoming a scientist are nothing but impossible dreams.So when she's given the opportunity to leave the Cloisters and put her skills to use as part of a scientific quest to discover the Remedy, Astrid leaps at the chance. Finally, she can have exactly what she want--or can she? At Gordian headquarters, deep in the French countryside, Astrid begins to question everything she thought she believed: her love for Giovanni, her loyalty to the Cloisters, and most of all her duty as a hunter. Should Astrid be saving the world from killer unicorns, or saving the unicorns from the world? 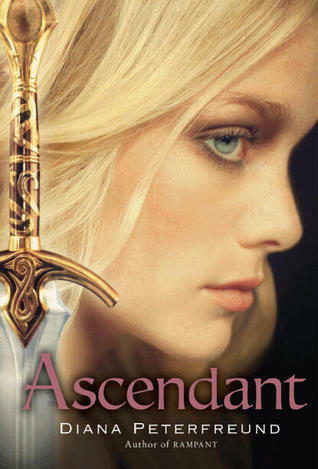 Ascendant is the second book dedicated to the fabulous Astrid and her gang of unicorn slaying huntresses. This book was quite a change from the first one. The first was all about discovering what it was to be a hunter, and getting girls to believe in who they are, and hunters in general. For the most part, this book takes us out of the cloisters and into the beautiful French countryside. Though they were the villains in the first book, Gordian pharmaceuticals turns out to be not so bad. They are actually really involved in the search for the remedy. However, something is slightly off beneath the surface of the company and Right from the onset of the book, there was a sinister and more tangible seriousness in the story that was absent in the first one. Ascendant really makes the characters grow up from scared little girls into powerful huntresses. The characters are much more world-weary and several of them are feeling the pressure and getting a little burned out. This book turned away from the themes of violence towards women, innocence, and sexuality that was incorporated into Rampant. Instead, Ascendant deals more with some of the global concerns that we deal with every day. The main issue was animal testing, and creating medicine through experimentation on animals.Astrid has to struggle with her hunter impulse to kill the unicorns. She starts to realize that the battle with unicorns isn't black and white. She is in charge of guarding the second most dangerous class of unicorn, einhorns, and she finds herself befriending them. It bothers her when she has to kill them, especially since it is in cold blood. She has to struggle with the differences between killing a rampaging "evil" unicorn, and killing a unicorn as it nibbles food out of her hands so that the scientists can run tests on it. There's also the issue of weather it is worth it to sacrifice innocent animals for the possible betterment of the human race. Lets just say that big moral struggles ensue and there's a lot of angst and action and violence. There were a few problems I saw with this book. The first being the casual acceptance of unicorns by everyone else on the planet. It was hard enough for Astrid to believe in unicorns in the first book when she had been told about them for her entire life...now regular people are just like..."Oh hey...did you hear that unicorns are real?? "...sorry, but in my book, the discovery of a species, not to mention UNICORNS would be a huge deal. You would get people trying to find and capture them, the cloisters would be overrun with nature documentary people and the like...I just feel like there would be a whole lot more of a reaction from the common people if unicorns were all the sudden pulled from fantasy to reality. There would probably be panic, especially if they were as dangerous as this book implies. I think there would be environmentalists lobbying for their preservation, sure...but there would also be a constant threat, and depending on casualties, there would be more of a push for unicorn containment and disposal...wow. I really can't believe I wrote that sentence in a review...ahaha. Ascendant is a much more politically and economically charged book. As such, there is a whole lot less action and plot involved. There was a lot of waffling around and agonizing over decisions and thing that were kind of annoying. I was kind of looking forward to more unicorn-slayings, huntings, and mystery solving and this book was kind of lacking in it. Also, this series has now succumbed to the "unnecessary love triangle". There was so much good between Giovanni and Astrid, and I understand that having a long distance relationship is hard to deal with..but then Astrid's insufferable ex comes back into the picture and it drove me absolutely crazy that she would even give him the time of day, let alone allow him to get involved in her amazing relationship. Seriously, Giovanni is such a catch, and so nice, and just...awesome...the fact that Astrid cheated on him made me kind of turn against her when I previously had been very much on her side. I was struggling with my rating for this book. While reading it, I didn't think that it was that bad, but then in hindsight a ton of things just kept bugging me. I still kind of like the characters and would be interested in where the series is going, but I find myself getting pissed off at their actions and decisions so it is kind of a struggle for me. I think that I'm going to give it a 3 out of 5 Keys. It was one of those in the middle books. I will continue the series if I see it in the library or somewhere, but I won't pre-order it or even buy it.There are just way too many other books that are better...Still...it was a decent and different read. So if you're sick of the Vampire vs. Werewolf thing, you might want to check out the Killer Unicorns. definitely going for Rampant first, was debating whether to buy or not. Number one, ever since I read White Oleander, I've been in love with the name Astrid! Number three, this cover is really cool. I need to find the book that comes before this one! Oh wow! I've never heard of this series before but wow it sounds so original! Thanks for the review I'll go check it out on GR! killing unicorns is a 1st lol. It does seem interesting but i dont know if i would have difficulties with the concept. Maybe it would grow on me? Thanks for the review! I actually love it when reviewers are torn when it comes to rating a book because it makes me even more curious about the book! This book sounds interesting, though you're totally right. If the world suddenly discovered that unicorns were real, I don't think we'd casually accept it. We'd probably freak out and question a ton of other tings, and even make sure that someone wasn't pulling a massive prank on us. I know what you mean about having difficulty rating books that you don't like but don't hate, but three stars sounds about tight. If I ever do get around to reading Rampant, I'll certainly check this out. Thanks for reading. It's interesting that you found the rest of the world's response to unicorns to be "casual" -- though I suppose that, compared to Astrid, whose entire life was changed by this fact, most people's response would be very casual! And, after all, you're seeing everything only from Astrid's perspective. A lot of what you describe actually does happen in the book -- such as Lilith getting rich off of becoming a "unicorn expert" for television news shows and TV people overrunning the Cloisters. In one of the unicorn short stories I've written, "The Care and Feeding of Your Baby Killer Unicorn" (In ZOMBIES VS UNICORNS) you see some of the post-unicorn changes from an "outsider's" perspective, which was fun for me to write. I actually based a lot of the response on the real response to a recent discovery of a "mythical monster" -- and wrote about it on my blog. wow cool! Thanks for commenting Diana! I have been meaning to get ahold of Zombies vs. Unicorns so there's another reason to do so! I will also have to check out that blog post of yours! I'm always interested in seeing what leads to the creation of the story!